Readers of The Prairie Ecologist blog will be familiar with posts from Anne Stine, a recent Hubbard Fellow who has moved to Texas to work with the Xerces Society. Anne has started her own blog now, and I think many of you will enjoy it. Here is a link to a recent post about keeping track of prairie plants she sees. She has some very nice photographs to accompany her thoughtful writing. I encourage you to subscribe to her blog if you like what you see. Anne Stine, harvesting seeds as a Hubbard Fellow with The Nature Conservancy. Anne is now working for the Xerces Society, based in Fort Worth, Texas. 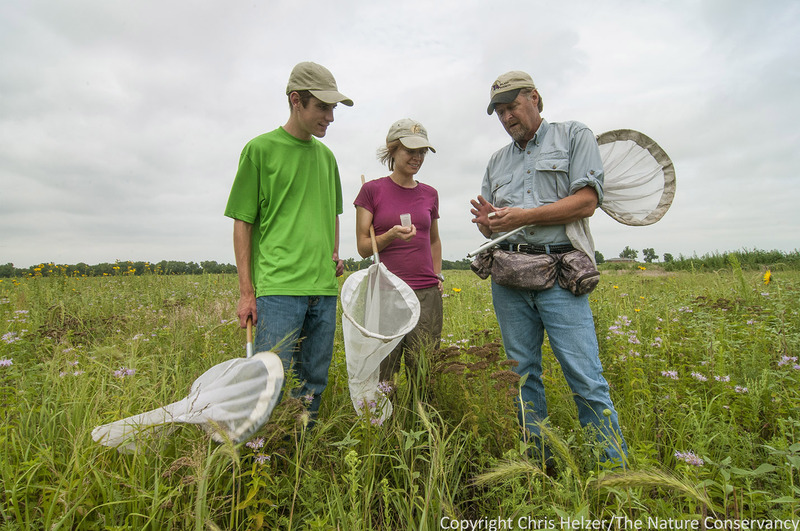 She’s helping to plan and create pollinator habitat throughout the Great Plains. Anne Stine’s last day with The Nature Conservancy’s Hubbard Fellowship Program was last Thursday. Her fellow Fellow, Eliza Perry will be here through the first week of June, but Anne has accepted a full-time position with the Xerces Society which starts next week. We wish her the very best in her new job and look forward to working with her on prairie and pollinator issues across the Great Plains! Anne’s farewell post is below. In addition, the Omaha World Herald featured Anne and Eliza in a front page story this week. You can see the online version of that story here. It would be hard to overstate how much I’ve had the chance to learn over the past year with the Hubbard Conservation Fellowship in Nebraska. I’ve gained an understanding of the work it takes just to hold your ground against the tide of environmental degradation, and I’ve witnessed the dynamic balancing act that underlies a healthy grassland. With Chris mentoring Eliza and I, we certainly learned plenty about the natural history of the Great Plains. One of the things I love about ecology is the way it opens your eyes. Before I knew what I was looking at, a walk outside was a pleasant green blur. Now I can pick out the details, and recognize old friends. Knowing natural history enriches your life in a very immediate, concrete way. Chris and Nelson also taught us about grassland management for biodiversity. They included us in their planning discussions, and explained their decision making. We learned what makes a grassland ready for fire or grazing, and we are getting real experience with the controlled chaos of burn season. There are also the intangibles. Trilling Sandhill Cranes have provided the soundtrack to my life for the past couple months. I got to help round up bison- TWICE- which is something so incredible it never even ranked as a possibility to me prior to this fellowship. Not to mention all the wonderful conservation professionals I’ve had the chance to meet and learn from. I’ve achieved both my objectives for this fellowship: I got real experience in land management, and I was hired for my dream job as my next career move. My advice for the next fellows would be: Dive in. You’ve been given the chance to thoroughly explore a topic of your choosing. Seize this opportunity, and you can truly change the course of your career. Anne Stine (center) learning about bees from Mike Arduser (right), along with Sam Sommers (left). Now that I’ve completed my Fellowship, I will join the Xerces Society as the Pollinator Conservation Specialist/NRCS Partner Biologist (Central Region), based in Fort Worth, Texas. I would not have gotten this position without the Fellowship. 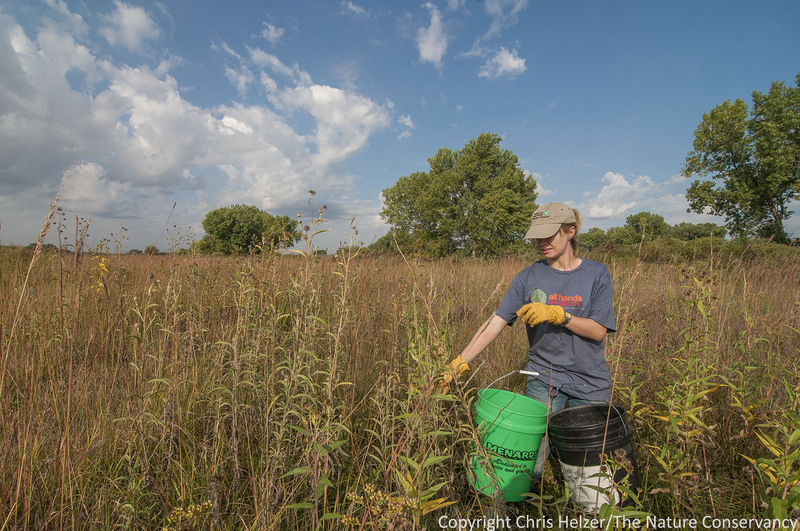 My hiring stems from my independent project, a comparative study of bee communities in restored and remnant prairies on the central Platte River. Bees are often treated unfairly. In fact, the world of invertebrates is fascinating. In large part, I have Mike Arduser and Chris Helzer to thank for introducing me to this new area of study. Mike gave an incredible workshop that served as my crash-course in bee taxonomy, and he has continued to be a mentor in all things bees. Chris, always enthusiastic about inverts, also helped prime my interest in native bees. With Chris helping as an auxiliary net-man, we sampled 8 paired plots (4 remnant, 4 restored) in late summer. We identified 33 bee species total, and counted 26 species in remnants and 20 species in restorations. While we are still in the throes of data analysis, we plan to submit a manuscript of our findings within the next couple months. It is our aim to put forward the diversity of the pollinator community as another measure (in addition to the plant community) of restoration success. Anne, collecting seeds of Maximilian sunflower. Platte River Prairies, Nebraska. I have so much gratitude for all the help, training, and mentorship I’ve received over the past year. The hiring materials for this fellowship promised “the whole enchilada”, and The Nature Conservancy in Nebraska delivered.